An expertly crafted debut, A GOOD DEATH introduces Sebastian Damon, a sharp-witted though struggling Boston PI who catches an intriguing case. Linda Watts is a beautiful, talented Southeast Asian refugee with a promising career in finance—or she was, until she turned up dead, the victim of a heroin OD, in a cheap Bangkok guest house. Her death seemed straightforward to the Thai authorities, but her insurance company isn't buying it. 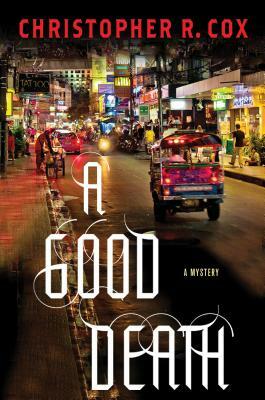 They send Sebastian halfway around the world to investigate—where he finds himself confounded and completely out of place chasing faint leads through the broken, bewildering streets of Thailand's teeming capital. An award-winning journalist, CHRISTOPHER R. COX has written on and traveled extensively through Southeast Asia for more than 20 years. His work has appeared in The Boston Herald, Reader’s Digest, Conde Nast Traveler, Audubon, Men’s Journal and ESPN: The Magazine. His books include Chasing the Dragon and A Good Death.